SolveBio and Elsevier, the information analytics company, have announced a collaboration to integrate the use of Pathway Studio, Elsevier’s database of biological molecular interactions and curated pathways, with SolveBio platform, providing customers with one seamless solution to drive better precision medicine research. Under the terms of the agreement, all licensed SolveBio users will have free access to Pathway Studio’s Pathway Viewer software, an application that enables researchers to quickly view a snapshot of the functional relationships among genes imported for SolveBio. In addition, researchers can find top scoring, manually curated pathways that correlate most highly with these genes. Both analyses take only minutes, saving researchers significant time, and delivering access to a growing database of published literature. SolveBio enables biopharma customers to leverage molecular information for therapeutic development by unifying and connecting data across the organization so that scientists can run analytics and answer questions in real-time based on harmonized internal and external data. SolveBio catalogues all of your data as biological entities, like variants, genes, and gene expression profiles, creating a centralized cloud-based inventory of all the biological components in your data layer. Then, leveraging technology and human expertise, SolveBio links the data across silos. SolveBio’s graphical interface allows researchers in your organization to find the right data at the right time to directly run analytics on all the data to answer mission-critical questions. SolveBio’s RESTful API brings unified, enriched data to downstream applications for analytics and visualization. “We’re excited about the integration with Pathway Studio from Elsevier, as it allows SolveBio users to tap into another advanced database of molecular data, instantly broadening the scope of their research,” said SolveBio CEO Mark Kaganovich. SovleBio users are able to access a seamless integration point to transfer and visualize their results both with Pathway Viewer and with the full functionality of Pathway Studio; thus revealing new insights and assisting with critical decision making. 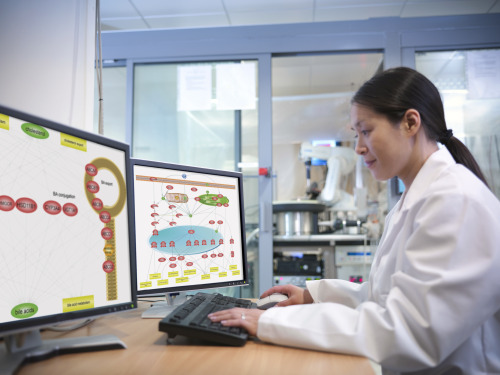 Pathway Studio enables scientists to explore molecular interactions and cause and effect relationships associated with underlying biological processes. The integration allows subscribers to Pathway Studio to seamlessly import their gene list directly into the application.